Wage Revision is a Right – Nobody can stop it! More than two lakh BSNL Employees have got the right to get wage revision w.e.f. 01-01-2017. It can not be denied on the basis of no-profit or loss. BSNL is a fully government owned company and its activities are based on the government decisions. It is implementing the social objectives of Connecting India, providing connections in lakhs of villages, where no private companies will dare to come since the connections are provided causing huge losses. Further due to the efforts of the workforce and the management, the losses has gone down. For the last two years, there is operational profit. Loss accounted due to depreciation of the large assets of the company can not be a reason for the denial of wage revision. BSNL Management has already brought these and other points to the notice of the DOT. But no guidance has been recived so far to start wage negotiations. There is no doubt that serious united struggles will have to be organised for achieving results. 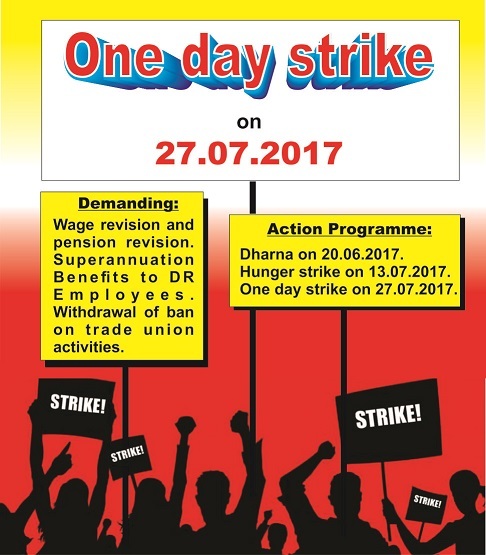 The agitational programmes, including the One Day Strike on 27-07-2017 called for by Unions/Associations has to be fully participated and made successful as the answer to the delay in wage revision.